Weeks of careful preparations were thrown asunder this week as Sno Daze kicked off at Eden Valley-Watkins High School. The first twist was a 2-hour late start Monday because of threatening cold weather. That threat became greater throughout the day, and before school was out Monday, it was announced that school would be cancelled both Tuesday and Wednesday as an Arctic blast moved ever closer. The annual variety show and coronation was held Monday afternoon, with all the usual pomp and circumstance. Olivia Kuechle and Jack Evens were crowned this year’s princess and prince. Congratulations! Photos from this event can be found on page 11. The Thursday through Saturday events should be able to proceed as scheduled, as warmer temperatures (above zero) are expected by then. 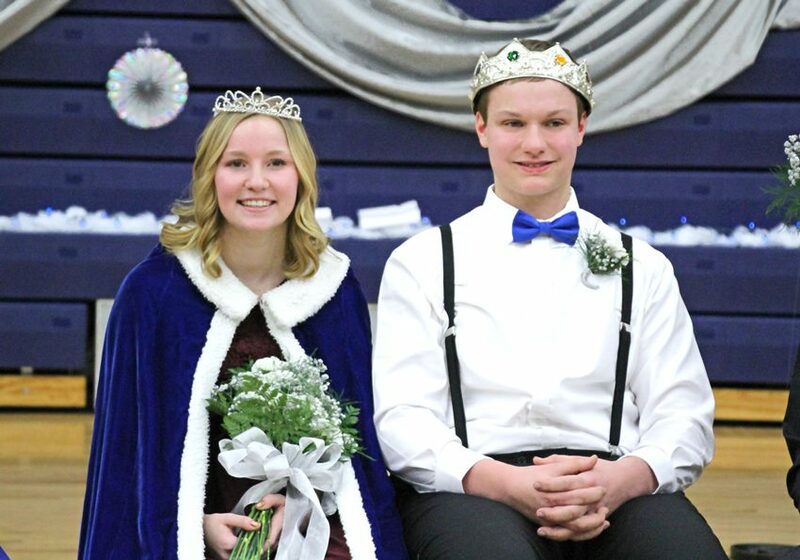 Olivia Kuechle and Jack Evens were crowned 2019 EV-W Sno Daze princess and prince at coronation that took place Monday afternoon, Jan. 28. Photo courtesy of Amanda Garding.